After clinching Chess.com's first Titled Tuesday on a Wednesday, Baadur Jobava duly continued winning. 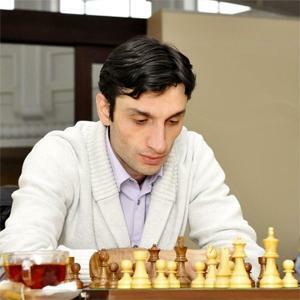 The Georgian grandmaster defeated Boris Gelfand in round eight of the Grand Prix in Tashkent, and is now tied for first place with Dmitry Andreikin and Hikaru Nakamura. Baadur Jobava is a strong grandmaster who plays a wide variety of openings, a player who seems to be looking for sacrifices all the time, and a player who logs in at night to play and win our first Titled Tuesday tournament. He's also a player who entered the Grand Prix at the last minute but now shares the lead, with three rounds to go! In the eighth round, Jobava was in fact the only winner (his third win as Black!). He faced an out-of-form Gelfand, and so a slightly provocative opening (1.d4 e6 2.c4 b6) was more likely to succeed than backfire. Caruana, Giri and Radjavov looking at Jobava's opening position. | Photo © Yulia Monakova courtesy of FIDE. On move 8, Gelfand took his queen on an adventure that made the game very complicated at an early stage. White was trying to avoid a continuation where Black could simply castle queenside and double rooks on the g-file, but eventually it was Gelfand who got into trouble. His pieces were somewhat clumsy, and lacked coordination. As soon as the center collapsed, White's whole position did. “A very complicated game. I don't know,” said Jobava at the press conference. | Photo © Yulia Monakova courtesy of FIDE. Andreikin and Nakamura both drew their games, and so they had to allow Jobava joining them in first place. Andreikin's game was an especially short affair. Vachier-Lagrave played his favorite Grünfeld, but not for the first time he was “out of book” at an early stage. However, in this 5.Bg5 sideline he found some pretty good moves over the board, and his opponent suspected it was home preparation! “I wanted to make it look like,” said the French grandmaster. The game ended in a move repetition rather quickly where it was Andreikin who perhaps could have played on. A very quick draw in Andreikin vs Vachier-Lagrave. | Photo © Yulia Monakova courtesy of FIDE. Radjabov's surprise was playing the Ragozin, and already on move 11 Nakamura went for an ending, because he didn't like the middlegame positions that could have arisen after either e3 and Be2, or g3 and Bg2. That ending was just very equal, and in no time the players reached the necessary 30 moves. A Ragozin, an ending, a draw. | Photo © Yulia Monakova courtesy of FIDE. Mamedyarov-Karjakin was much more entertaining. After their amazing Nimzo-Indian fight at the Candidates’ Tournament, Mamedyarov again played the 4.f3 variation, but Karjakin deviated immediately. At some point the Russian GM could force the draw, but since he was a hour up on the clock in a complicated position, he decided to continue. “A few moves later I wasn't very happy,” said Karjakin, who soon was on the defensive side. Luckily for him Black was always OK.
Mamedyarov and Karjakin about to start their sharp Nimzo. | Photo © Yulia Monakova courtesy of FIDE. Giri and Jakovenko played a bunch of theory as well. Black's positional queen sacrifice in this Symmetrical English had been tried before in a game Bacrot-Nisipeanu last year, but Giri had found a slight improvement: avoiding a quick rook trade. However, the Dutch grandmaster then hesitated on the kingside (an immediate h2-h4 was called for) and Jakovenko found a smart setup, a.k.a. a fortress! Giri a weak world number 7? Nah! | Photo © Yulia Monakova courtesy of FIDE. Caruana and Kasimdzhanov then also drew their game, a Queen's Gambit (we haven't seen that one for a while!) where the world number two went for a quick ending. “I have to say it wasn't a very good game from my side,” Caruana said, and that remark was mostly about one move: the weird 18.Bc7. “I don't have to get worse in a few moves which is what I managed. (...) I don't have an explanation for 18.Bc7,” he said. A funny moment at the press conference (see below). | Photo © Yulia Monakova courtesy of FIDE. Thursday is the second and last rest day in Tashkent. On Friday two leaders meet in the game Jobava-Andreikin!